When I first began reading this classic I opted to ignore the foreword (or all three of them in this case). I don’t know how anyone feels about the inclusion of forewords in but my primary reason for reading is enjoyment. I don’t really want to read the opinions and theories of an academic that will perpetually skew my imagination and feelings. It’s almost like watching a movie before reading the book; it ruins the journey on which your mind may travel with the development of the plot. I started and I loved it from the first. Obviously, the language is somewhat archaic but the fluidity of his prose is beautiful and far from being too descriptive, it is spot on with eloquent grace. Where some classic authors have a tendency to become overly verbose in an attempt to portray accurately a scene, Collins is wonderful in that he is accurate and descriptive but not so much that he does not allow the reader to form their own picture. One of the reasons I refuse to watch films based on books prior to reading them is because the visual spectacle of films often ruins my enjoyment of the book. Part of the enjoyment in reading is creating the scenes in your own mind. I will admit that, although I loved the prose, it was somewhat slow and ponderous to begin with. Scene setting, in this instance, right back to Hartwright’s initial meeting with the unfortunate Anne Catherick, is vitally important and the scene is set well. However, the direct and somewhat impersonal relation of events makes for a dull read when the true crux of the story has yet to begin. I was not gripped by the 1st Epoch of this story, that is not to say I did not enjoy the reading of it, but at the beginning of the second epoch, I was entranced by the start of a truly subversive and cruel plot. I have barely put the book down since commencing the second stage of this tale, hoping from one moment to the next that the future of the characters would become apparent. I was, in all honesty, unprepared for the winding complexity of the story to encompass so many different facets of the villainous characters nor the depth attributed to some of the smaller ones (you must know I refer to Pesca). I have enjoyed classic writing before and not felt the need to pardon myself for underestimating the brilliance if the plot construction. I truly did not expect to be so captivated, some plot twists I was able to guess with ease, Anne’s disclosure of her illness and the supposed Lady Glyde’s submission to an illness not previously suffered were telling enough, but others left me somewhat astounded. I was not prepared for the origin of ‘Sir’ Percival’s birth, or for the uncovering of Anne’s paternity (though I really should have guessed as much). I was very unprepared for the way in which the identity switch was carried out. The one thing that still evades my comprehension is the true strength of character displayed by Walter Hartwright. Throughout his recall of events I failed to grasp where the astonishing show of strength came from. I know, from the assertions of the writers themselves, this tale is supposed to be a free and accurate portrayal of events, free from emotion and opinion, I found nothing in Hartwright’s telling to presume him to be either so clever or so righteous as to carry out his actions. I appreciate his affection for Laura Fairlie and although he expresses his love and admiration for her I don’t FEEL it, I feel more of his true and abiding friendship with Marion Halcombe than I feel his affection for Laura. I felt his effeteness in his begging of Marion to help him get away from England and his pitiful mewling on his love for Laura. Is it wrong of me to think that the entirety of the strength in the relationship between the three of them was all in Marion Halcombe? I confess that even with his trip to Central America and the misfortunes that befell his compatriots he still did not seem to me to be much changed in himself. IF there had been some change in his writing and his outward zeal, a shown strength in his language, I would have believed him more up to the task of extracting the necessary information from ‘Count’ Fosco. No, I enjoyed the telling and the conclusion was reached very satisfactorily for all of the interested protagonists, but I am unable to tally the character of Walter Hartwright to the hero he undoubtedly is, to his wife and her sister. I think I have been reading this too often and it has affected my own writing. I can only hope it is a short-lived occurrence and that a return to my usual writing will happen soon. This entire page has been an exercise in pomposity and verbosity but I’ll keep it just to remind myself that I should NOT write so soon after reading another’s work. 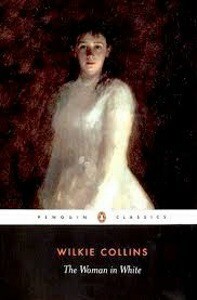 This entry was posted in Articles and tagged Review, Wilkie Collins, Woman in White by Mamie. Bookmark the permalink.